After 35 days the No. 15/15 Quinnipiac Bobcats finally return to play a home game at High Point Solutions Arena. While the students are still on winter break, the men's hockey team is trying to make its push towards a 5th consecutive NCAA tournament. Currently 18th in the pairwise rankings, Quinnipiac has to make up a lot of ground to position itself to have some breathing room come March. That won't be an easy thing to do with very few games against teams ranked ahead of them in the pairwise left on the schedule. The Colgate Raiders come to Hamden on Friday and they have struggled so far this season at 4-11-4 (2-4-1 ECAC). Colgate has lost six of their last seven games beginning with the first Quinnipiac game and also have lost five one goal games this season. While the record is not good for the Raiders they are playing hard for Don Vaughan unlike another team in the ECAC that has mailed it in for the season. Quinnipiac won the last meeting this year 7-3 on the road at Colgate at the new Class of 1965 Arena. Overall the Bobcats are 19-14-2 all time against the Raiders and hold a 9-4 record against them at home. It has been a challenge this season on offense for Colgate as they are consistently struggling to score goals. They rank 46th in the country in goals per game at 2.47 but that number drops to 2.29 in ECAC play making them the third worst offense in the ECAC outside of Dartmouth and RPI. They have a very young and inexperienced team up front that has been trying to improve on the fly over the course of the season. Four of the team's top five forwards are underclassmen. Sophomore Adam Dauda is tied for the team lead in scoring with 12 points (5 goals and 7 assists) with senior defenseman Jake Kulevich 12 points (3 goals and 9 assists). The lone draft pick is senior Tim Harrison who lead the team in goals with seven and has a total of 11 points on the years. Three freshman forwards have all shown some promise in Bobby McCann 11 points (4 goals and 7 assists), John Snodgrass 9 assists and Jared Cockrell 9 points (3 goals and 6 assists). 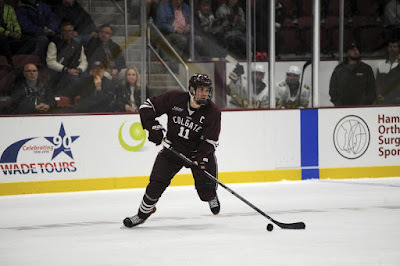 These younger players are getting the experience they need now, which will benefit them a year or two down the road when Colgate hopes to turn this thing around. 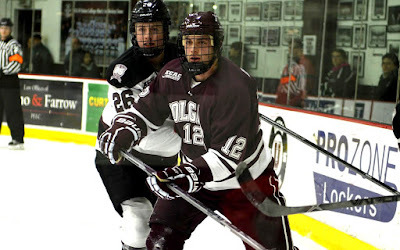 The Bobcats should play a similar game to what they did the last time against Colgate which was keep the Raiders to the boards limiting the amount of shots they put on net. On defense Colgate has also struggled mightily this year giving up 3.37 goals per game ranking them 49th in the country. In ECAC play they give up 3 goals per game. Collectively the team is a minus 16 this year which shows part of their struggles on the back end. The last time these teams met, Quinnipiac pounded 51 shots on the the Colgate defense and goaltender Charlie Finn. Outside of seniors Brett Corkey and Jake Kulevich, Colgate has a lot of youth on the blue line that just isn't seasoned enough to face off against offenses that are more talented than them. Quinnipic needs to use their speed and physicality against the Colgate defense to their advantage to be able to force them into mistakes that will lead to scoring opportunities. Senior Charlie Finn has gotten the majority of the workload playing in 14 of the 19 games for the Raiders. He has struggled a bit this season, but he has a young and inexperienced defense in front of him this year. On the season he is 3-8-3 with a 3.21 goals against average and a .900 save percentage. Those numbers are well below what he put up in his first two seasons for Colgate. Freshman Colton Point has played in four games and is the future in between the pipes for the Raiders. He is 1-2-1 with a 2.99 goals against average and an .886 save percentage. It wouldn't surprise me if Point got the start since Finn gave up seven goals the last time against Quinnipiac but I would still expect to see Finn in between the pipes. This is a key game for Quinnipiac to pick up more ECAC points and to maintain there standing in the pairwise rankings. A loss to the Raiders might seal the Bobcats at-large fate as this would give them two losses to teams ranked 40th or below in the pairwise rankings.